Dostoyevsky (2002) by Manuel Sandoval. On second thought, do these opening words stand alone as poetry? On the anniversary of Fyodor Dostoevsky's death — January 28, 1881 — we revisit his existentialist Notes from Underground. Published in 1864. I am a spiteful man. I am an unpleasant man. I think my liver is diseased. In some circles, Notes from Underground is regarded as the first existentialist novella. One of the many paradoxes to be found with Dostoevsky is that in at least two instances; Poor Folk and The Brothers Karamazov he writes that "poetry is rubbish." In death, he is interred near Karamasin and Zhukovsky — his favorite poets. 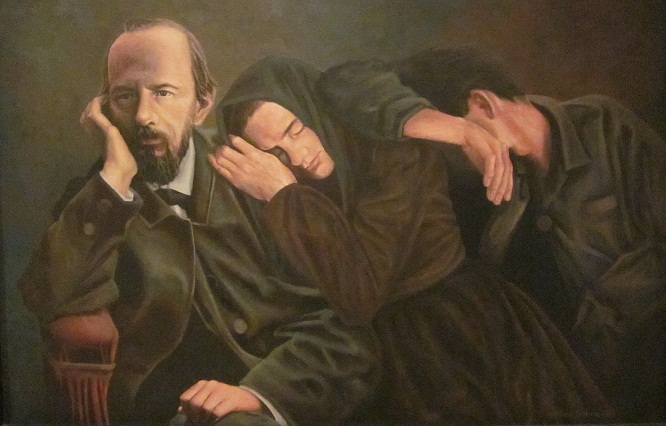 The photo accompanying this piece, Dostoyevsky (2002) by Manuel Sandoval is part of the permanent collection at the National Museum of Mexican Art in Chicago.